VIVE will be featured in a window display in the Harmony Store Oxford Street, London, for the next two month. With the release of a new brand, one of the most important things is a good marketing campaign. The main goal is to make consumers aware of the new product, recognize the designs and feel a connection with the brand. Part of this can be done with lifestyle images, videos and online representation on various platforms. VIVE now wants to take their campaign to the next level. 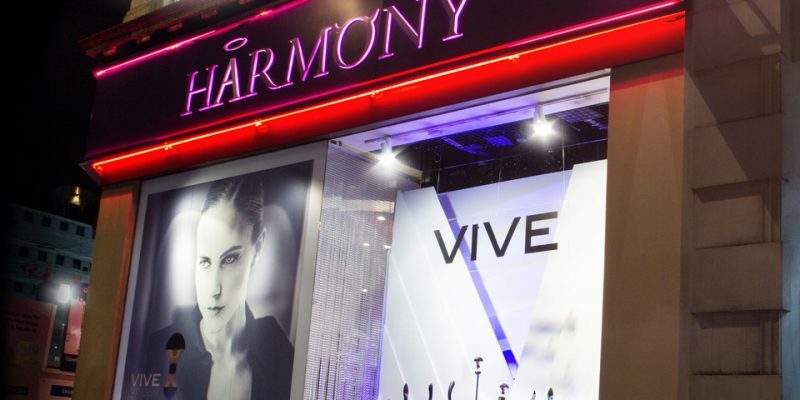 In collaboration with Harmony, VIVE will have its own complete window display, showcasing the brand to the streets of London. The Harmony store is located at 103, Oxford Street, bang in the center of London. As one of the best store locations in Europe it has on average 200 million passers-by per year. With this in mind the Shots in-house design team has come up with an eye-catching 3D structure for the store window, that will surely draw the attention of passing consumers. At the front of the construction there will the various VIVE designs presented on a stand.